Click the image to see it large enough to read, not that reading it will help. This is for a frying pan. The handle for the lid, which includes at steam venting ring, comes in pieces and this tells how to assemble it. In addition to the English, you have to love the steps which are labeled 1 through 5 and 5 through 1. The 5-1 numbers actually label the illustration. Make sense now? No?? I think that means you're normal. I know, everyone does (many vegetarians will cheat for bacon). But I mean, I really love bacon. And, sniff, I think it loves me, too. It seems to follow me around. Or maybe it's stalking me. How can anyone be miserable in a world that has bacon. Having noted that Tide says it is useless, I saw an ad on Food Network for "Kraft Horribles." Kathy and I saw it twice and both of us heard it that way. The product is actually Kraft Pourables. Is it just me, or does anyone else think the claim on this bottle of Tide is funny? OK, I had to share this. "She's handled dirty diapers, skinned knees, teenage tantrums, and questionable college majors--doesn't Mom deserve something special? These gifts are designed to pamper, please, and pay tribute to the leading lady of your lifetime." 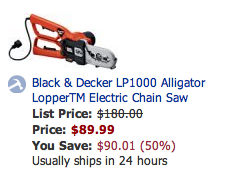 And there on page one, they were suggesting a "Black & Decker LP1000 Alligator Lopper Electric Chain Saw ." Maybe that's for handling those pesky "teenage tantrums." There was a time when color was strictly the woman's province. My Dad picked the car, the engine, the tires, and the power accessories but the colors were for Mom to choose. I remember our first new car. Dad brought home a huge book of GM paint chips and upholstery swatches and placed it in front of Mom , like some mysterious puzzle. Mom would agonize over whether Champagne Mist or Platinum Mist would best carry our family into the 70s. These days, men participate in the color decisions, but not always with confidence and skill. It's not that we're genetically incapable. Watch the guy in the body shop match paint, blending it wet, eyeballing the mix and knowing it will dry to a precise match to the slightly faded color on the neighboring panel. Then watch him meet his wife in the furniture store and tremble when faced with a choice between periwinkle and cornflower. Men like things simple. For instance, there are three blues: Dark blue, light blue, and turquoise. A really sensitive guy knows about navy (that's dark blue, for the rest of you.) Eight Crayolas are enough for most men. The only reason a man needs the 64 Crayola set is because he wants the built-in sharpener. Men, there will come a time, no matter how skillful you are at ducking into the garage, when you will be expected to help pick a color. Maybe it will be the new living room paint; maybe some shoes; maybe even something as fraught with danger as new drapes. "No-o-o-o!" you say! "Let me hunt the saber-tooth! Let me rebuild a carb! But don't make me pick drapes!" Relax, compadré. It's not as tricky as you fear. All you need is this, the Handy-Dandy Guide to Fluffy Colors. We'll translate all those strange and exotic color names into terms you can understand. When she asks if you prefer the mauve or the peach, you can sneak a quick peek at the Guide and confidently point to the right patch as you triumphantly say, "This one, the mauve, is just the shade to pick up the magenta flecks in the new lamp. And I like its silvery quality!" Okay, I lied. You'll never talk like that, even if you memorize everything in the guide. Colors go in and out of style and new names appear all the time. Color mastery is beyond us unless we read the fashion magazines and pay attention to color trends. And if we do that, how will we have time for important things, like teaching our sons to spit? Maybe you'll never be a color wizard, but with this guide, you will sometimes know what she's talking about and every so often, you may even have a good suggestion. In any event, you're sure to surprise women by using these terms -- because their expectations are low. White Big trick! There is snow white, ivory, antique, oyster, cream, winter white, appliance white, and a zillion more. Off-white -- there's a funny one. Just be careful when you're in white territory. Black Much safer than white, but watch out for very dark blues which are decidedly not "black." Gray Trickier than white, there are warm grays (brownish or pinkish or mauvish) and cool grays (bluish, or sometimes referring to neutral grays). Then there are greenish grays which, I have been told, are "very critical." Grays are tricky. Sorry I can't be of more help. Charcoal Dark-to-medium gray. Lighter than the color of new charcoal, darker than the color of charcoal ash. Silvery Different from "silver," this term refers to a sheen. Any color can have a silvery quality, except brown, which is not permitted to be silvery. Rust An easy color. Unfortunately, it is only "in" for short periods. Beige Very light brown, reallll close to off-white. Chocolate Milk chocolate, they mean. Mahogany Why can't they all be this easy? Lilac Light purple, but not lavender. Lavender light purple, but not lilac. Mauve A subdued pinkish grayish purple-like color. or, light pink with a silvery quality. Good luck with this one. Hot pink Really bright pink. Rose "roses are red..." Wrong. Rose is dark pink. Red A trick. There are orange reds (think of a tomato) and bluish reds (think raspberry). Women are very sensitive to nuances in red (look at the lipstick display in the drug store, if you dare). Picking between shades of red is too advanced for most of us. Brick They mean red bricks. Football If Levolor would use some names like this, maybe we would willingly help pick out new blinds. Peach Light orange. You would not eat a peach this pale. Trout Why isn't there a color "trout?" It would even be silvery. Melon Who makes up these names? This one means light orange, the color of the inside of a cantaloupe. You're supposed to know this? Autumn Gold Yellow-Orange, to us. Harvest Gold Yellow-Orange, to us. Lemon Yes! It's yellow! You're getting the hang of this. Goldenrod Yellow. Look at the state flower for a hint. Stanley Yellow Or Caterpillar tractor yellow. Why can't they use terms like these? Avocado Darker than the inside, lighter than the outside. Actually, the green color they used for appliances in the sixties. Sea Green Turquoise (Dark teal, for you advanced color captains). Mint Green Dark sea foam. Sea foam Lighter turquoise, a bit more green. Powder Blue Light blue. You have never seen powder this color. Teal Thank you, San Jose Sharks, for teaching us one damn color. Makita Blue Throw that in a color conversation Sometime. There is no woman-name for this exact shade but we know what it is. Ha! Periwinkle Blue. Cornflower, teal, and periwinkle are pretty in, and have been for some time. The difference between them is pretty subtle and your y-chromosome prevents you from safely discussing these in any depth. I suggest you nod knowingly and suggest something a little more silvery.